"While free Wi-Fi is ubiquitous in airports, coffee shops, hotels, and other highly trafficked areas, this service is no longer unique to these locales. Guest Wi-Fi is now expected in nearly every industry – but how do you deliver Wi-Fi while enforcing acceptable use policies and meeting compliance regulations? 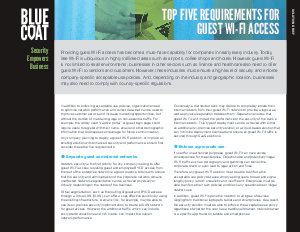 Dive into the requirements for Wi-Fi security by consulting this brief resource today. Inside, find five essential recommendations to help you make Wi-Fi security your business reality – read on to get started now."